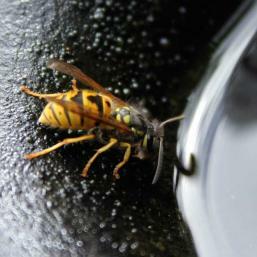 There are a wide variety of wasps that visit our gardens during spring and summer. The parasitic varieties are highly beneficial. Paper wasps all have their positive and negative traits in that they are ‘general predators’ taking beneficial as well as harmful caterpillars from the garden. The most voracious predator of all is the European or ‘Germanic’ wasp. These live in nests that can get huge, they are identified by the lemon yellow bands that distinctly mark their black abdomen. Germanic wasps are also ‘general predators’ but they do a great deal of damage to the native ecosystem and are considered to be a significant pest. 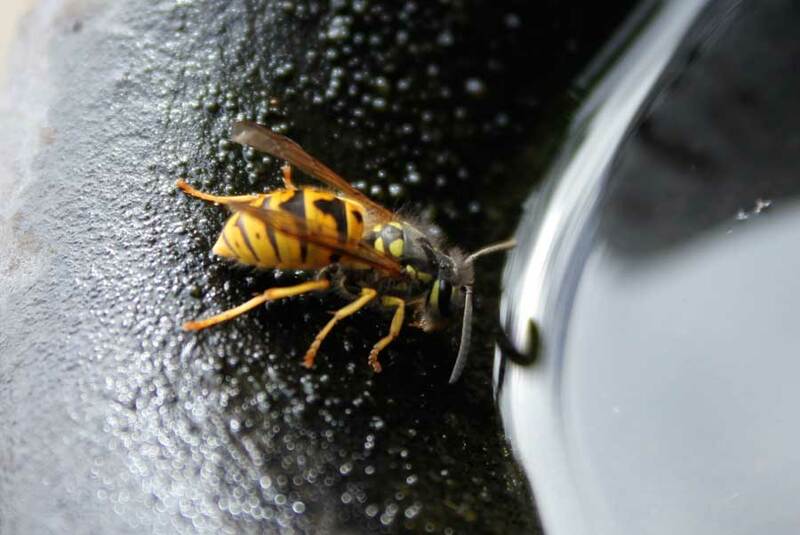 Germanic wasps can be a major problem for bee keepers as they rob hives of larvae and, in late summer and autumn when they are in need of protein, they attack and dismember honeybees as hey enter and exit the hive. For this reason beekeepers hunt down nests and destroy them. 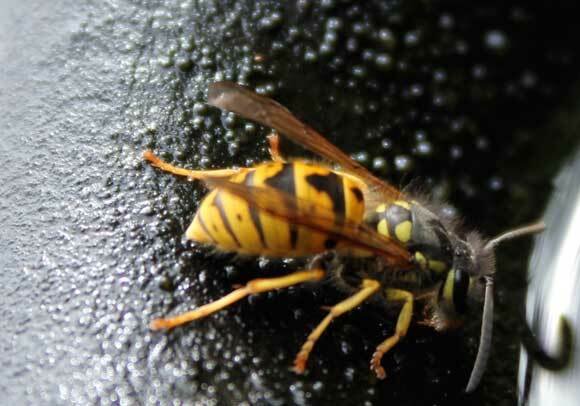 Wasps are most active during the warmer months when queens are laying large numbers and expanding the size of hives. At the end of summer, worker wasps die off and queens leave the nest to hibernate. You will often find them in old sacking and tucked away in cardboard boxes. In the spring, queens emerge and start a new nest. 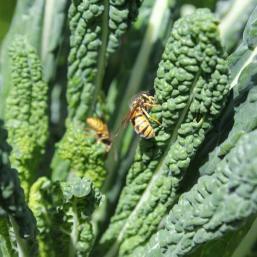 Paper wasps: These are seen as a pest by many but they hunt green caterpillars on garden plants and carry them off for food. Nests are often suspended from branches in leafy shrubs or attached to buildings. They comprise papery cells in which queens lay eggs. Larvae are fed a protein-rich diet of caterpillars by workers. Nests are best removed at night when wasps are most docile and all are resident. Parasitic wasps are the largest group of wasps in NZ. They do not sting and they can be tiny but they are still very useful in the garden. 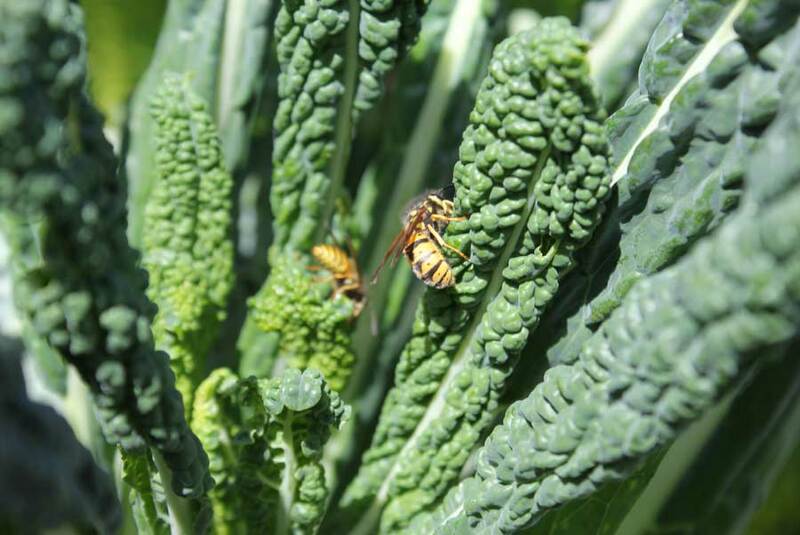 Females lay eggs in caterpillar eggs, aphids and other pests. The wasp larvae hatch and consume their host. The easiest way to control Germanic wasps is to hunt for the dozy queens during winter when they are hibernating. The garage and the garden shed are good places to look for them check piles of old newspapers, cardboard boxes, drop sheets – anywhere sheltered and warm. Alternatively keep any eye out for nests during summer. If you find one it might be a job for a local ranger if you are close to or inside a park. Otherwise pest control companies can be brought in. Beekeepers, with the right protective clothing, pour petrol into the nests of Germanic wasps at night and plug exits with soil. 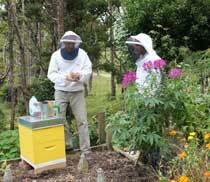 The petrol vapour can kill an entire hive if the right amount is used. This method is not recommended unless you have watched someone, who knows what they are doing, do it first.